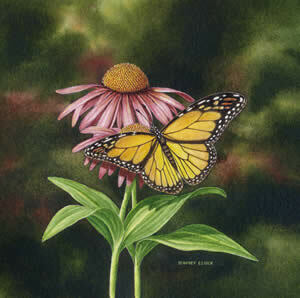 "Coneflower of Choice: A Pair of Prints"
It is one of nature's acknowledged miracles. Each spring caterpillars all across the globe crawl out on limbs or onto rafters and attach themselves prior to encasing their bodies in an impervious coating to become a cocoon. After many weeks with no food or water the caterpillar, now transformed into a beautiful butterfly, will crack the cocoon open and unfold its colorful wings and fly off in search of nectar from the nearest flowers. As they flit from flower to flower the small, lightweight creatures delight young and old alike. Some people even believe that butterflies are the embodiment of angels who have come to comfort the sick and encourage the bereaved. Perhaps they are right. Butterflies come in many colors and sizes. There are blue, yellow, green, and all shades of brown but the most common and the most recognizable is the beautiful black and yellow Monarch. When a Monarch butterfly flutters across your field of vision you can't help yourself, you just have to stop whatever you're doing and watch. 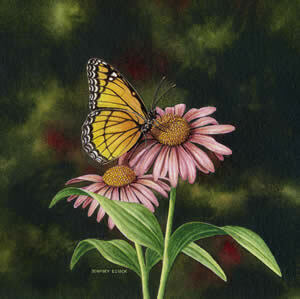 Dempsey Essick's painting has captured all the color and wonder of the broad winged flyer at the moment of alighting on a beautiful coneflower. Everyone has seen a similar sight in their own garden or on the plants around their house. It is always a magic moment. The nice thing about Dempsey's painting is that it can be enjoyed year round, even when the snow flies. As is the artist's custom, a rebus type image of a hummingbird is included in each print. Enjoy your search for the hidden hummingbirds.